Our network and supply chain mapping service allows you to analyse interactive maps and quickly identify critical patterns and dynamics within your network. FutureMap is a customised network and supply chain service provided by Future iQ®. Future iQ analyses networks within communities, regions, organisations and supply chains. It provides you with interactive maps that reveal information flows, patterns of collaboration, and supply chain dynamics. It highlights the strengths and vulnerabilities within your network, as well as identifying key network hubs. This allows for targeted intervention. FutureMap identifies the key connections and gaps in the network, exposing the critical issues that impede success. This unique service enables individuals and organisations to understand and use the maps. FutureMap stimulates innovation, increased information flows and collaboration through the formation of intelligent networks. 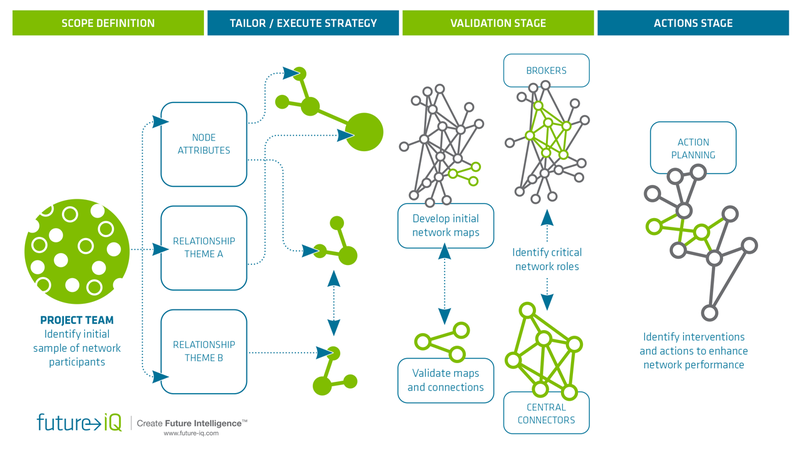 Based on your network maps, Future iQ provides a targeted intervention strategy which enhances your strategic success and competitive advantage. Future iQ is a market leader in network mapping, having pioneered the application of this methodology in regional planning. More than 5,000 key stakeholders have been engaged throughout regional, industry, government, community and corporate sectors. FutureMap allows stakeholders to build and use interactive network and supply chain maps. The maps are used to identify key network roles, such as who are the Influencers; Connectors; Brokers; Networkers and Resource hubs. They highlight the strengths and gaps in the system, and allow you to directly identify how to achieve optimum levels of collaboration and connectivity.